Sure, you could cheer on Atlanta United, the Falcons or the Braves at home. Or you could grab your lucky jersey, indulge in some wings and beer and cheer for them while watching the game on the big screen TV with dozens of other fans. So whether you're a fan of soccer or football or just in it for the snacks, these are the best sports bars in Atlanta for watching the big game. For the ultimate sports bar experience, head Downtown to Stats Brewpub, aptly named thanks to the ticker that runs over the bar with the current scores for all the games. There are TV’s galore, perfect if you find yourself wanting to watch more than one game at once. It’s also conveniently situated in close walking distance to State Farm Arena and Mercedes-Benz Stadium in case you need a place to kill some time before catching the action in person. The menu is decked out with cleverly titled menu items like the Hail Mary Hummus and the Namath’s Wrap with artichokes, goat cheese and quinoa. The restaurant also features five bars in its multi-level building. Don’t feel like standing around at the bar? Seven of their tables have beer taps at the table – bonus points for convenience. Seven—the number of points your team goes up after a touchdown and extra point and also how many Hudson Grille locations there are throughout Atlanta, making it one of the city’s most popular sports bars. Each location has dozens of TV’s scattered throughout the restaurant ensuring proper viewing from every angle. Every day you can partake in enticing drink specials, like $3 pre-game shots, $14 pitchers of Bud Light and Michelob Ultra and $5 cocktails. Expect to find classic sports bar offerings on the menu – nachos, sliders, chicken tenders, etc. If you’re feeling frisky, order a round of the ghost pepper insanity wings—not for fair-weather fans. Hampton + Hudson isn’t just one of Atlanta’s hottest restaurants, it’s also a game watching hotspot in the center of Inman Park. The spacious restaurant offers a huge bar and plenty of tables, each with a great view of the big screen TV’s. While you’re cheering for your team, order a few snacks off the pub-inspired menu – we recommend the H+H Chicken Wings, Fried Chicken Salad and Hampton's Fish + Chips. Libations include 21 craft beers on draft, seven unique wines on tap and creative takes on classic cocktails. They offer specials throughout the week, including a rotating BillyBurger and featured beer for $10 every Monday, Happiest Hour with a $4 menu Monday through Friday from 4-7pm and half-off wine carafes every Wednesday. The community restaurant and bar is also an official Atlanta United FC Pub Partner and shows every match of the season. Reservations for 10 or more people are available for sports watching. The Vortex is an Atlanta staple and was made even more famous when it appeared on Man V. Food for its Double Coronary Bypass burger (with two patty melts as the buns and 12 slices of American cheese, this burger is not for the faint of heart). Besides life-threatening burgers, the Vortex has ample seating and a large bar with plenty of TV’s to catch the game. Bonus: it recently went smoke free. The restaurant is 21-and-up only, so have no fear of offending the kiddos. Everything at the Vortex is over the top, from the eclectic décor (i.e. skeletons on motorcycles) to the gluttonous bar food and cocktails. Popular eats include the Cheese Ball O’ Glory, fried balls of cheese curds and jalapeños; and the Hot Southern Mess, a fried chicken sandwich topped with an egg, bacon and gravy. There’s an extensive beer list, but you may need to order the Skull Crusher – a dangerous blend of tequila, vodka, rum, bourbon, liqueurs and sparkling peach wine—depending on how your team is faring. With its central, Midtown location Cypress Street, is easily accessible and a great spot to meet up with friends to watch the game. There are TV’s inside, but when the weather's amenable, you’ll want to post up on their patio. Don’t worry, the patio has TV’s, too! While you’re cheering for your team, munch on the sweet potato nachos loaded with blue cheese, bacon and sriracha sauce and wash it down with one of the over 40 beers on draft or in a bottle. Specials that fall on game day include the $6 Chuck, a double stack burger with fries all day on Monday, and half-off wine bottles from 7 to 11:00 p.m. on Thursdays. Take note, though, they don’t accept reservations so plan on getting there early if you want to sit while watching your team play. Tucked between Midtown and Buckhead, Tavernpointe may not immediately spring to mind when it comes to watching the game – which is exactly why you should go there. The restaurant has a couple of big screen TV’s over the bar in an otherwise low key setting. Grab a seat at the bar, order yourself a draught cocktail (like the mango and pepper sangria), and enjoy the game without hundreds of other people. The menu offers contemporary American dishes with Latin flavors. Standouts on the menu include the Peruvian chicken with aji amarillo salsa and fried jalapenos; the Mexican street corn and the guajillo chicken tacos. If you’re not feeling a cocktail on tap, they also have a full bar with other cocktail options, beer and wine. This hipster hotspot in Inman Park is perfect for foodie fans who want to watch the game in a low key environment with stellar food and drink. Treat yourself the brunch beignets or share the poutine or crispy buffalo wings with house ranch dressing. Cocktails, beer and wine are available, but if you’re in it for the long haul spring for one of the communal cocktails, like the Punch Seventy-Five with gin, sparkling wine and lemon juice. UGA grads may recall Pauley’s in Athens as a hole in the wall crepe joint. The Atlanta location has the same crepes, but way more space. Not only is there a huge bar and ample seating, there are also several large screen TV’s – 11 to be exact. Combine this with their 40 beers on tap and a special game day menu and you have a winner. Pauley’s is also a great spot to stop in before or after a Georgia Tech game (it’s just down the street) and isn’t too far from the Mercedes-Benz stadium, either. As the name suggests, the Nook sits just across the street from Piedmont Park in the heart of Midtown. 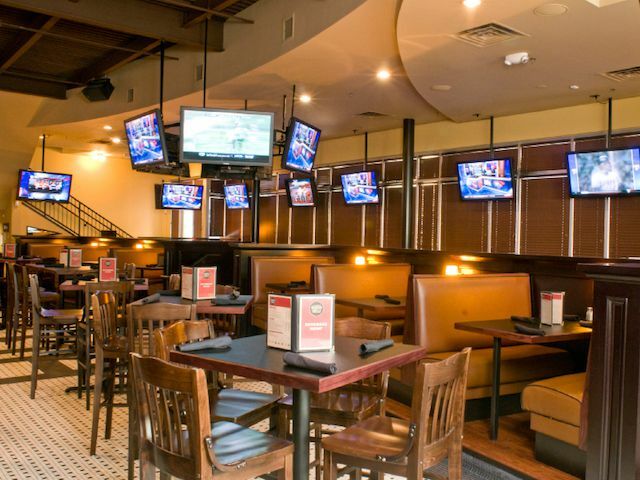 Here you’ll find cozy confines, and plenty of TV’s to take care of your football needs. Since 2009 the Nook has established itself as the place to go for two things: their Totchos—tater tots piled high with toppings like cheese, meats and veggies—and fish bowls, gallon-sized fishbowls filled to the brim with boozy concoctions (they’re meant to be shared). They even offer The Giving Totchos which benefits local nonprofit the Giving Kitchen. With its close proximity to the Mercedes-Benz Stadium and televisions galore, Smoke Ring is an ideal spot to pop in before going to a game. The husband and wife team of Jordan and Erin Wakefield helm the kitchen and the bar. Jordan turns out his takes on Southern classics like the BBQ deviled eggs with bacon and bourbon marmalade and classic barbecue offerings. Erin slings cocktails to wet your whistle with popular go-to’s like the Frozen Mule and Bootlegger’s Companion (mmm…moonshine). On game days you can eat there, or grab some of their housemade beef jerky to go. Not your typical dive sports bar, Dantanna’s prides itself on its upscale atmosphere, making for a more refined game watching spot. More like a steakhouse and sports bar hybrid with plush seating, there are TVs all throughout the restaurant, even on the spacious patio. With locally sourced beef, chicken and pork, expect tasty bar food like Cajun chicken rolls, spicy blue crab fingers and, if you’re feeling fancy, several aged steaks. Belly up to the bar for Monday Night Football to take advantage of half priced appetizers. Wash them down with beer, wine or cocktails. This East Atlanta hangout is a popular viewing spot for Footie Mob, fans of the championship Atlanta United team. With snacks ranging from pimento cheese fritters to boiled peanuts to tots or fries with three sauces, you won't go hungry. The bar also serves weekend brunch and hosts regular bocce, trivia, corn hole and other activities, so even non-sports fans will stay entertained.